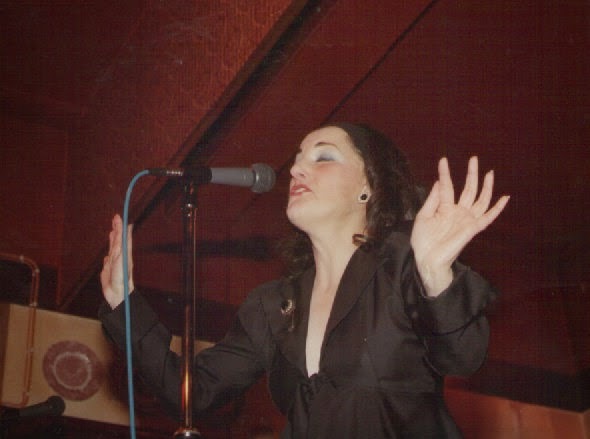 bebop spoken here: Sheila Giles Photos added to archives. Sheila Giles Photos added to archives. More photos of the late Sheila Giles have been added to the archives courtesy of Margaret Barnes. A lot of them are short on info such as dates, venues and names. If anyone can help please do. Oh my, in the album linked above, second row down, photo on the right, this was taken in my club/restaurant, The Speakeasy in London, sometime between 1985/90. Sheila performed there a few times. She became a very good friend. Happy, happy days. Please tell us more about your friendship with Sheila and the Speakeasy. Hi Lance. Well Sheila came in to my club one night for dinner with a friend and to listen to some jazz (pianist and singer). We got talking and she told me she 'used' to sing a bit, what an understatement that was, lol. After talking for a while, we agreed to meet up the next day and talk about her doing a gig, which we did. It was a complete sell out and Sheila was sensational, had the audience in the palm of her hands. She appeared a few more times and always went down a storm. We became close friends, even when I moved back to Edinburgh to bring up my family. Sadly we lost touch when she moved out of London, then back, then away again. I feel a real sadness that she's no longer with us. She was one of a kind. Hi Joyce, speaking to Margaret Barnes, who provided some of the photos, she remembers Sheila talking about you and how good friends you were. She also thought that Dave Green and Mick Pyne were probably on the gigs that she did at the club. Lance, Yes, Sheila always used Mick Pyne and his musicians for her gigs at the club. Fabulous musicians. Helen, sadly I don't have any recordings of Sheila singing, how I wish I did have. She was one of a kind.Not only an amazing singer, but a true entertainer. The stories that woman could tell!! The Paul Edis Trio @ The Cherry Tree. April 28. Lonnie Liston Smith for Hoochie! CD Review: Vasilis Xenopoulos - The Wind Machine. Ballads and Blues @ The Jazz Café - April 25. I'll Join the Legion That's What I'll do! Paul Skerritt Band @ Cherry Tree. April 21. Bombay Jazz Radio 4 - 4pm. CD Review: Jeremy Wilms - Diamond People. Burandanga @ Hoochie Coochie April 18. Chaka Khan @ Hoochie next month! Pink Lane Jazz Co-op at The Globe is going ahead! Britain's Greatest Ever Jazz Musician? This Sunday (April 20) @ Blaydon. Jazz Record Requests - BBC Radio 3 today 5pm. The Collective @ Hoochie Coochie. April 10. GIJF Day One - Robert Glasper Experiment. Radio 4 Rounds off GIJF! Vieux Carré Play the Blues When it Rains! GIJF Day Three - Polar Bear.